For the Toronto Raptors to win a game against the Cleveland Cavaliers in the Eastern Conference Semifinals, they need to do certain things. They can’t let LeBron James dominate the game (easier aid than done of course), but even if he does, they still have a shot to win the game—but only if their stars play like stars. So far—their stars are not playing anything like stars. Kyle Lowry and DeMar DeRozan combined for just 39 points in Game One. Wednesday night in Game Two they did even worse. Lowry matched his production from Game One with another 20-point night, but DeRozan struggled to make a basket. He didn’t make his first shot until the fourth quarter and ended up just making two of his 11 attempts (five points). With that kind of production from the team’s two best players, the Raptors are going to have a rough series—especially if LeBron James and Kyrie Irving shoot well. They certainly did in Game One (59 combined points) and did even better in Game Two (61 points). James scored 39 while Irving accounted for 22—but they didn’t have to do it all themselves. They got some help from a few of their teammates. Channing Frye chipped in 18 points, mostly from behind the arc (5-7 from three-point range), and Iman Shumpert had 14. Much like Game One, this one was as good as over before the fourth quarter started. Toronto held a 9-7 lead early in the first but found themselves down 34-22 by the end of the quarter. The Raptors got within nine points in the second quarter but were down by 14 points at the half, 62-48. 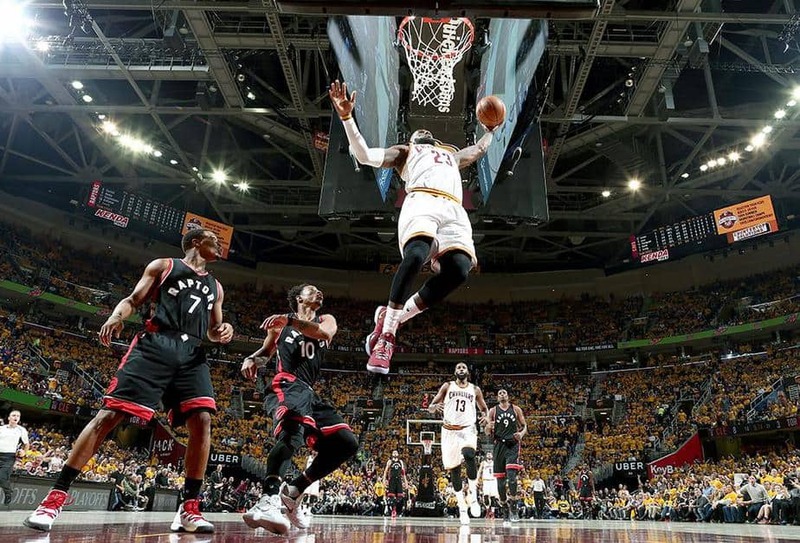 Just like in Game One, the Cavaliers put the Raptors to bed with a huge third quarter (37-25). 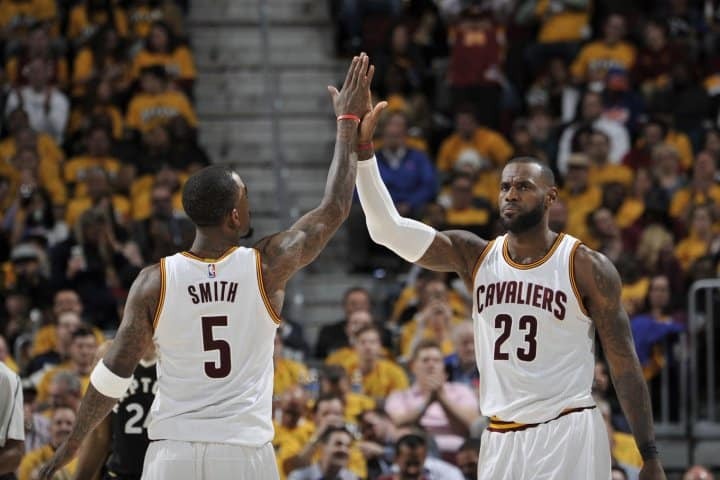 With a 26-point lead, Cleveland could have coasted during the fourth quarter and still win. But they made Toronto work for it instead and only allowed the Raptors to narrow the gap to 22-points, 125-103. James needed just 25 points when the night began to pass Kareem Abdul-Jabbar for No. 2 on the NBA’s all-time postseason scoring list. The record-breaking shot was a three-pointer that came during the third quarter. With 5,777 postseason points to his name, James now trails just Michael Jordan by 210 points. With at least six games left in his 2017 postseason, there is a chance he could break Jordan’s mark this season if he can average 35 points a game (he’s currently averaging 32.8/game in the postseason). Hopefully heading back home for Game Three and Four will help them find that level–but they may have to do it without Kyle Lowry. Lowry sprained his ankle during Game Two. The Raptors will need him if they are going to have even a remote shot at salvaging pride from this series let alone a win. Game Three will be Friday at 7 PM ET on ESPN.